Interest! Would it also be possible to indicate how to make the cowl a little smaller if anyone ( like me) has a short neck? Oh, how very cool! Yes, I'd LOVE to see the step-by-step how-to! Beautiful top. I love the split collar! Absolutely!! I would love to see a tutorial. I have been trying to figure out just how to do a cowl neck on tops for myself, so I would appreciate anything other than just a basic neckline! Please please make a tute for this collar...I love this! It looks so cozy, especially in that colour. A tutorial would be great. This is really nice. I would LOVE, LOVE, LOVE a tute on this collar. It's really beautiful! It's lovely Pam. I would love to see a tutorial also. Yes! I would like a tute on the collar. Love the top and color, too. I think it is unanimous for the tutorial for this. Lovely top and love the look of this knit. Suede like feels sounds luscious to me! Congrats on the weight loss! And YES!!! I'd love a tute on the collar, it's a great looking collar. Love the top - both color and collar. A tutorial would be appreciated. Glad you are getting to sew for yourself. That top is so pretty. I, too, would love a tutorial. You are always so generous with us! thank you! Yes, please! Love it, Pam! Oh yes. I'd love a tutorial on thsi collar. The color is beautiful. 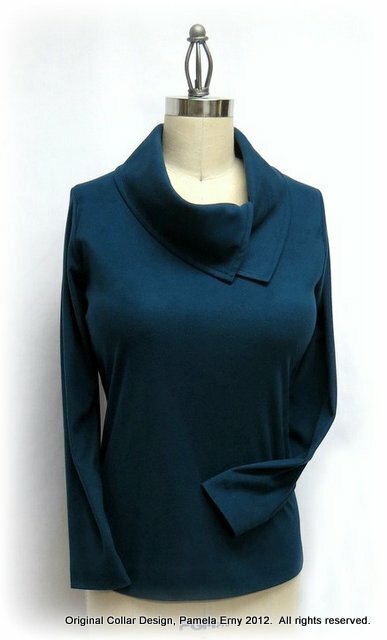 Love a comfy stretch top, and this collar adds a touch of class to an otherwise plain top. Would love to learn how to draft it! Thanks for your generosity! I always enjoy your garments, they are so beautifully sewn and stylish. You have such talent with details! This is lovely and I'll add my name to the list who would appreciate a tutorial! Congrats on the weight loss! And congrats on sewing for yourself! What a great top!! Yes, please! I love the color you chose for yours. Very cute and yes, I would love to see a tutorial on your collar! 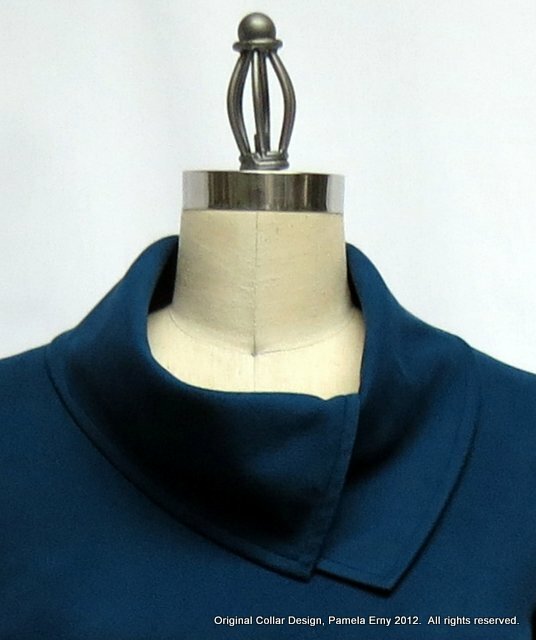 I love the color of your top and would really like to see a tutorial on how to make your collar. Thanks so much for offering it up! Lovely top. What fabric did you use? Tutorial-please, yes and thanks. Would love a tutorial - love the collar - I'm always looking for a new neckline for my TNT T.
I agree with everyone else: this is a lovely top! The split collar is beautiful, and I'd love to know how to create one. Please, please, please for the tutorial. Thank you in advance! Oh, yes, Pam! I would love to see a tutorial! Thank you! Absolutely a knock-out. I'd love a tutorial. Fantastic collar - I dream of being able to execute perfection like this. I love it - Other Pam. Love the collar you added to the top! And it's a wonderful color too! Hi flowergarden129, I will show you how the collar can be applied to any depth or width of neckline, and how the collar can be made in a variety of widths.....it is an extremely versatile technique. PLEASE do a tutorial for the collar. I have a long neck and this would be a wonderful twist on an old pattern. I am looking forward to your tutorial on this collar, and variations. I really like it! Just waking up in Australia and adding a resounding "yes please" to your tutorial offer overnight :) its a lovely neckline Pam and your tutorials are the best! The collar on that top is great. Congratulations on the weight loss. Yes please! It's a beautiful addition to any plain knit shirt. tutorial? yes, please! ...and thank you!!!! I had bought 2 of these sweaters at a popular dress shop a couple years ago.. Then I gained weight due to medication & could no longer wear them. They were still like new. After searching the house 3 or 4 times & couldn't find them.I decided I've got to find a pattern to make my own. I would love for you to make us a tutorial for the neckline. You are so generous with your knowledge Thanking you in advance. Yes, would love to see a tutorial on how to make the collar. I think it is very flattering and perfect for the colder weather. Pam: the split collar is beautiful! A tutorial would be most appreciated! And congratulations on your weight loss! From someone who needs to loose a lot of lbs., howdya do it? Good for you! This is beautiful and just what I'd love to have. Please make the tutorial! Thank you! Beautiful! We all would like to see! Very classy collar! It would be attractive (and warm) on a coat as well. It's nice to see you posting on sewing something for yourself :) I'd love to see a tutorial, I love them al! Congrats on the weight loss!! I lost almost half of myself this past year....90 pounds. I love your blog and am dying to get back to sewing for myself. I can use a tutorial on this collar....and anything else you want to "tute" about!! I love your blog!! just made a robe using your cowl collar instructions and love it. The info from the purchased pattern would have made the collar huge. I keep a "Pam" folder for all your wonderful tips. Please 'split a cowl' for us. Love the collar. Yes, for a tutorial. Nice! I like that it doesn't look tight on the neck. Such a flattering style! I'd love to give a collar like this a try. I'll look forward to your tutorial. Thank you for sharing!!! Just spent most of the weekend reading your blog. Holy Cow, lady! Not only talented, but so incredibly generous -- thank you so-o-o much! I love this collar! I bet it frames your face nicely. Yes, I would love to see a tutorial on this collar. After my thyroid was removed about 1.5 years ago, I gained 50 pounds (!!!). I was devastated. So while I waited for the thyroid medicine to start working, I drastically changed the way I was eating. 2 very small meals during the day (like only 2 cartons of 100-call yogurt), and then a normal dinner without bread, potatoes, or anything starchy. And the biggest factor in my weight-loss I think were these 2 things-- moderate exercise, and NO snacks after dinner AT ALL. So what the "experts" say about weight-loss really did work for me..."Eat LESS and Move MORE"
Anne K....wow, thanks for the generous compliment, you made my day! yes, please do a tutorial for the split cowl collar. It looks lovely, cosy, and a little dressier than a standard cowl neck. Congratulations on your weight loss. I am working toward my goal weight and am about 40% of the way there. It has been a lifelong challenge, but I am doing far better now than when I was younger. You are in good company with others determined to make progress! Congratulations on the weight loss. I would lOVE to see a tutorial on the split collar. Thanks! Yes, yes and yes! This is so classy looking (and the color is gorgeous)! What pattern do we start with...I'm slow and need the head start. That is a wonderful color and I like the split collar as well. I would love a tutorial. So many knit tops either have an utterly boring and unflattering neckline or are far too fussy. I love this one and the asymmetry will be flattering to many. If you have time to make a tyre I would very much appreciate it; I already use your tips in men's clothing and they are very helpful. Tutorial please! You're such a fabulous teacher. Tutorial Please! I love that collar and have just started to do a lot of knit sewing. Thanks for the offer! The shirt and collar are beautiful (and you're looking good to fit this! Congratulations.) I often wear scarves to dress up a crew neck--this is better. Hmmm...and I'll bet the ends could be extended and loosely tied. Your constant outside-the-box thinking has inspired me again. Yes, yes, yes!!! Absolutely write us a tutorial if you're willing. I'd love it!! I doubt that you need more encouragement, but I'll go ahead and add my request for the tutorial. It's a lovely, slightly different, take on a collar. You do so many of these intersting yet still subtle details in your work... you are such a creative designer! Does a fish like water? Your tutorials are always great! Please indulge us when you have the time. This is a great looking top, Pam, and I would love to see a tute on your collar construction. Congrats on the weight loss and I hope that whole thyroid thing is now under control for you. I've known people with thyroid issues and it amazes me how seriously it affects one's weight. I have been looking at blogs today and this is the first think I have sen that I really like. I would love a tutorial on how it is/was done! That pullover looks absolutely gorgeous with the split cowl collar! Personally I would love it if you made a tutorial to go along as well. Your tutorials are always wonderful and Inspiring! I love the split collar and would love to know how to draft one! What a gorgeous top in a gorgeous color! You are so creative and write very clear tutorials. I am looking forward to the for the split cowl collar. Congratulations on the weight loss -- keep going! I bet that you feel better, also. I would really appreciate the tutorial!! Thanks. Blessings! Very nice. A very creative look. Beautiful work, a tutorial would be lovely! The collar is beautiful. I would love to see a tutorial on this collar. I too would love to see a tutorial on this lovely collar. I am making a fleece hoodie out of micro-fleece, but don't want the hood, I would like a cowel neck. Do you think this pattern would work for micro-fleece or would it be too thick? Yes! it would look great in Micro-fleece...I've made some tops like this in the past from micro-fleece. "Jewel Neck", does this mean a high collar? Thanks! Hi Elaine, "jewel" is a term for a certain depth of a neckline. It is higher than a "scoop", lower than a "crew".